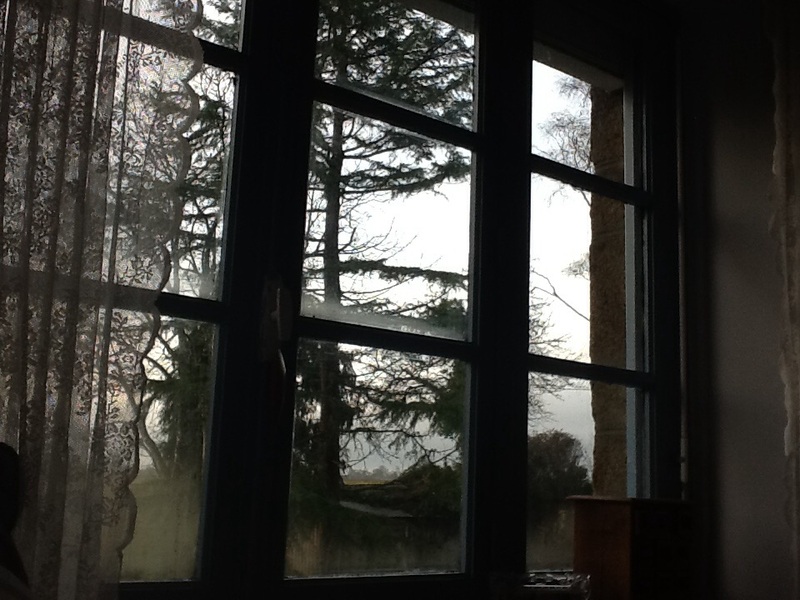 This is the view from where I sit in bed. I love it because this tree is so old, and could teach me many things, it sways gently in the breeze and I sit and watch it, watch the birds landing in it, and it just grounds me. That is why it has been so important for me to be back in my bedroom, I have missed this and, at times, have felt really stressy these past few weeks. 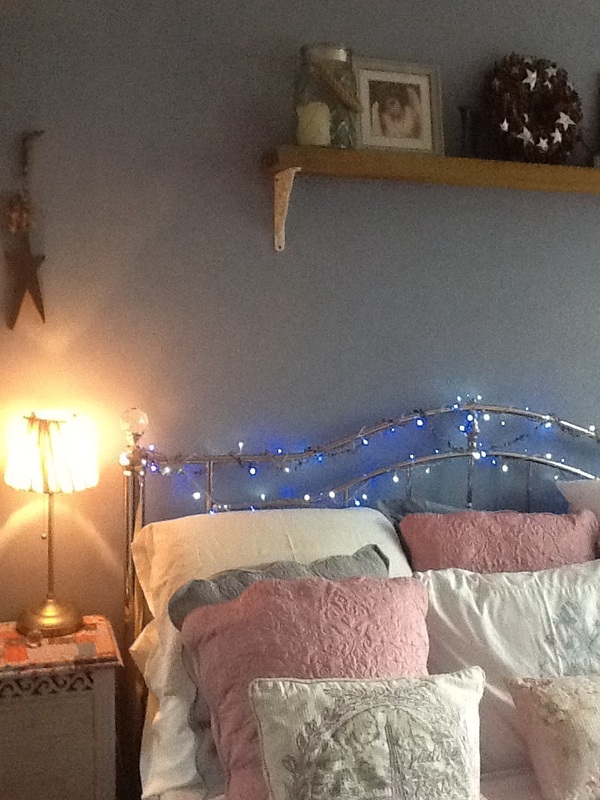 So here it is folks, I won’t keep you in suspense any longer, our new bedroom. 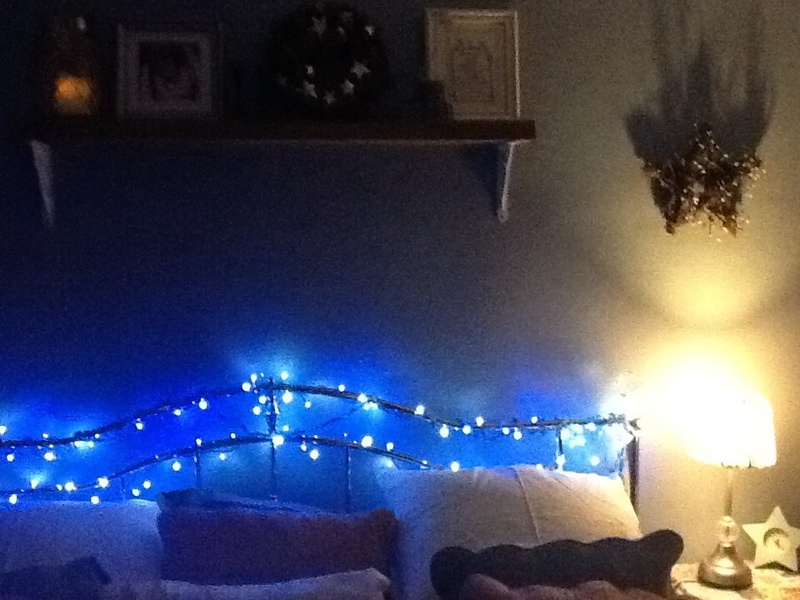 Our bed, with the wall that caused so much strife behind it. 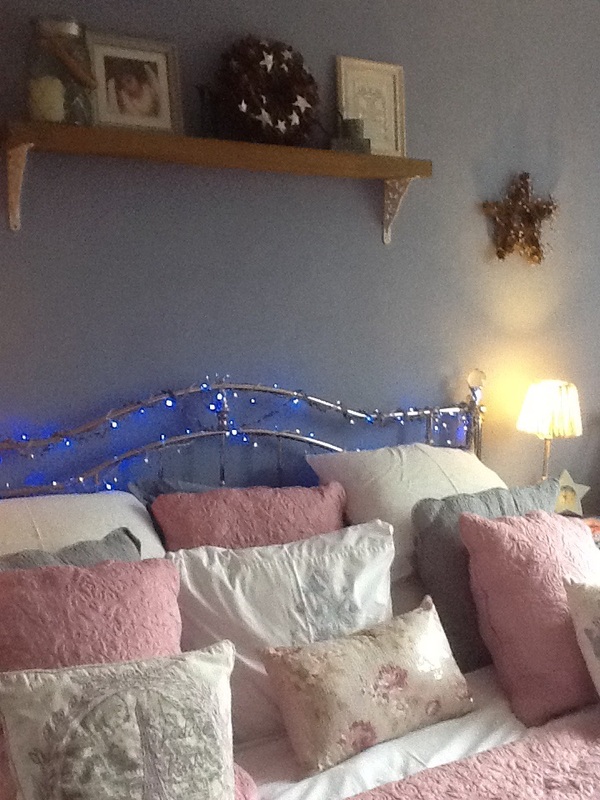 We have put up an old rustic shelf we bought over from the uk, and yes I do like lots of pillows! 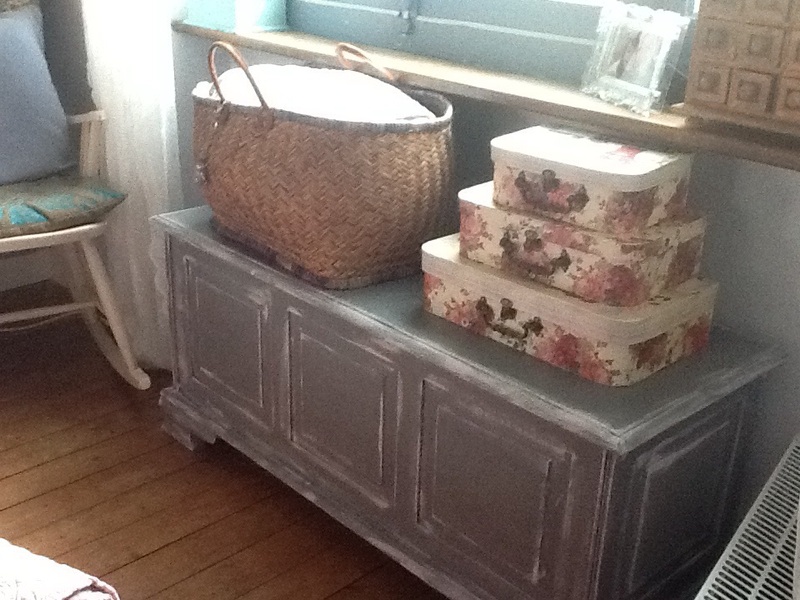 Then there is our old blanket box, I treasure this because my late mum bought this for me. 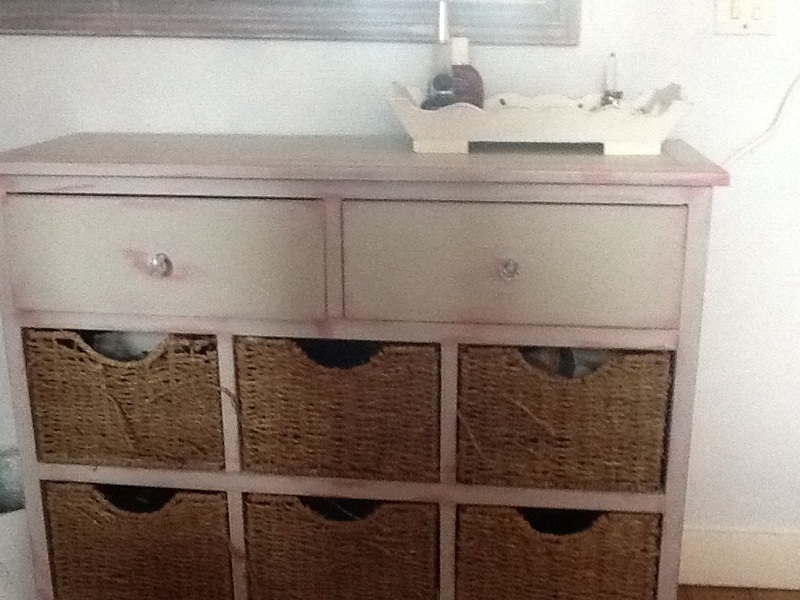 I’ve painted it a slate grey and then dry brushed with my lilac/ pink chalk paint. The old radiator has come out, so it will fit under the window, and the wall has finally dried out. The rocking chair is going to be pale grey I think, but that’s a job for after Christmas. Then we have my wonderful husbands idea. 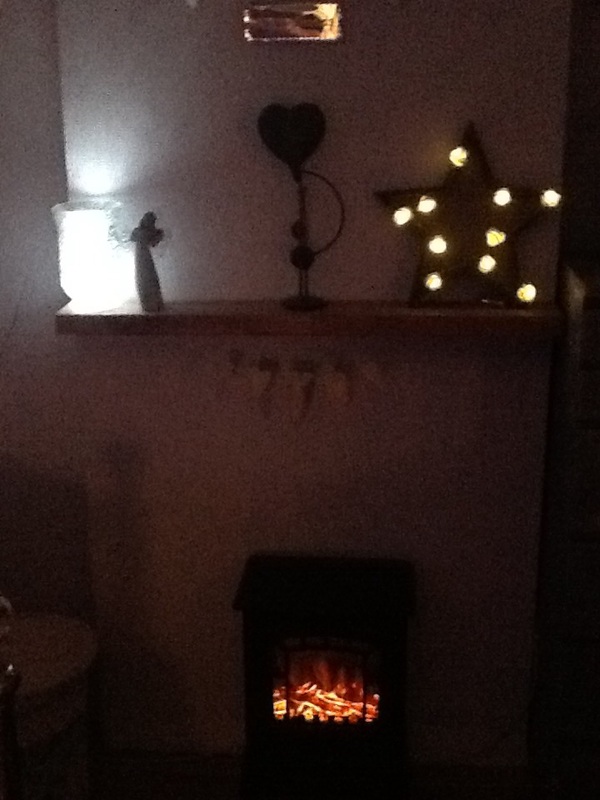 We have the chimney breast going up through our room, and Rich came up with the idea of making a faux fireplace, we put up another old shelf we had brought over with us (sad I know but we love old things, and their patina of age, so it had to be done.) 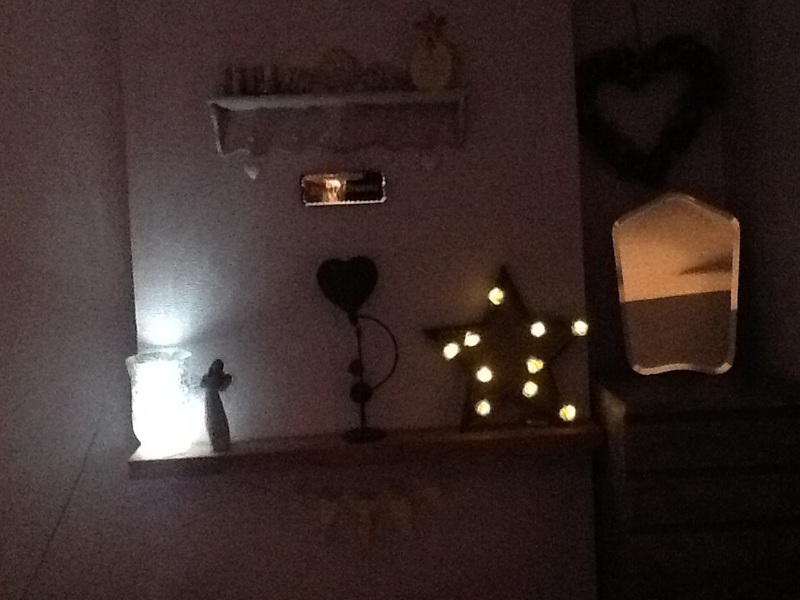 the small shelf above it was a gift years ago from my dear friend Mary (she does love a bargain, and always seems to keep me in mind), who also bought me the star and lights, now taking pride of place. The angel garland was a gift from my dear friend Lorraine, many years ago; and that is the thing about doing this kind of adventure, you have to pack your memories away, the things that people have bought you over the years, the things that make you smile. Often it is some time before you see them again, and when they start to come out they make you smile all over again. 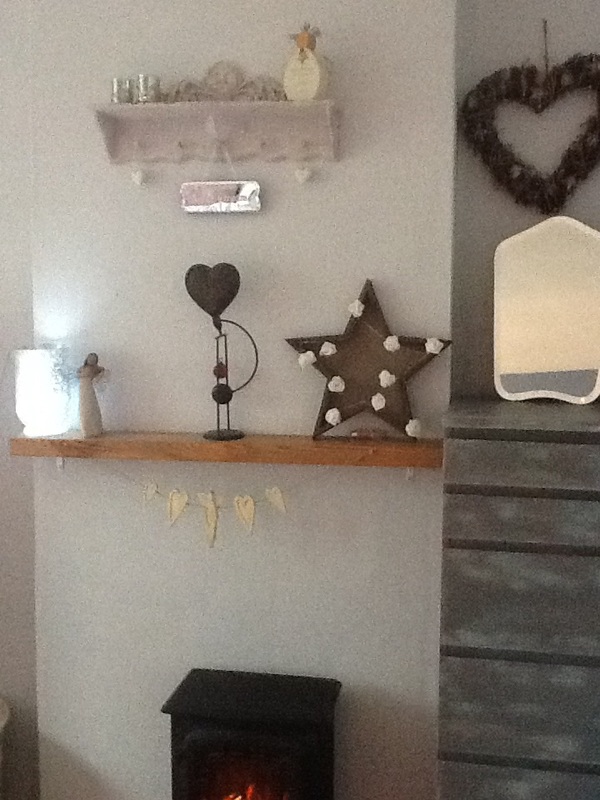 You can see Rich’s tall boy, I’ve given that and the mirror by it a slightly industrial distressed feel, and our MDF unit underneath has been given a new lease of life, with some pale grey chalk paint dry brushed with a retro shade of bright pink. So it’s finally done, and sitting here, it has been worth every bit of hard work. I have put lighting features throughout the room, which include the glow from the electric stove (no Heating required, just the effect!) so I have Included some night time photos. I would love to hear your comments on my recent instalment of our adventure, and thought I might suggest, in this festive season, that we have a bit of a game. See if you can spot the memories that I have now retrieved from their boxes. There is the angel “holding his heart”, as my lovely husband told me when he gave it to me as an anniversary gift, the lilac angel, that my sister bought me many years ago, now in her rightful place. There is the sparkling star that my wonderful friend Mary bought me as a leaving gift when I started this adventure, she told me it was “because you shine so brightly.” Look out for the rusty star my husband bought me from this Shaker shop, and the apothecary chest bought by my dear friend Russel. It has finally found it’s home. Then there is a cross stitch that our wonderful friend Terri made us, when we renewed our wedding vows, you will not be able to read it but it says ” a wedding is an event, a marriage is anachievement.” And finally there is a picture of an angel in a silver frame, another gift from my friend Mary. Enjoy, and please, folks, I would live to hear your comments. 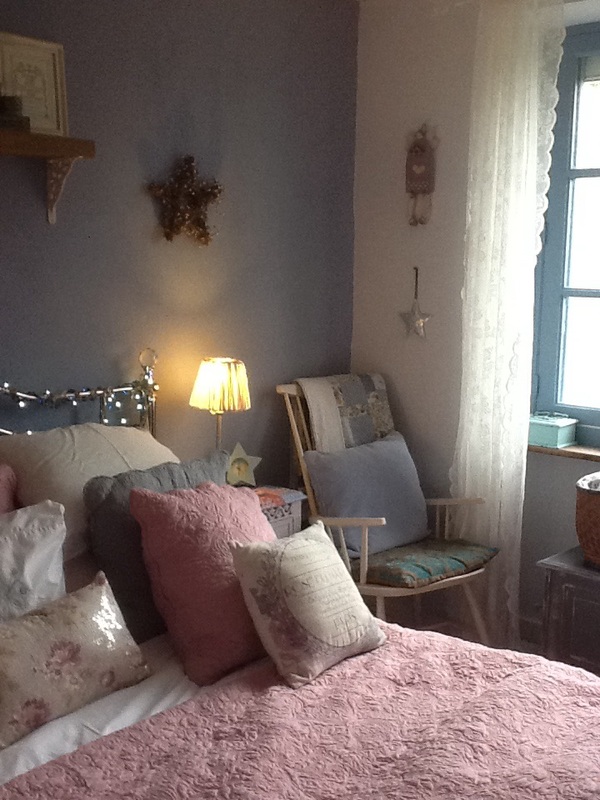 Very appealing soft colors, and the lights make it so cozy for midwinter. You did such a nice job together making that back wall smooth, and the furniture all fits your theme without being identical in color. I especially like the wardrobe you showed earlier and this blanket chest. Must have been a lot of work, but well worth it. 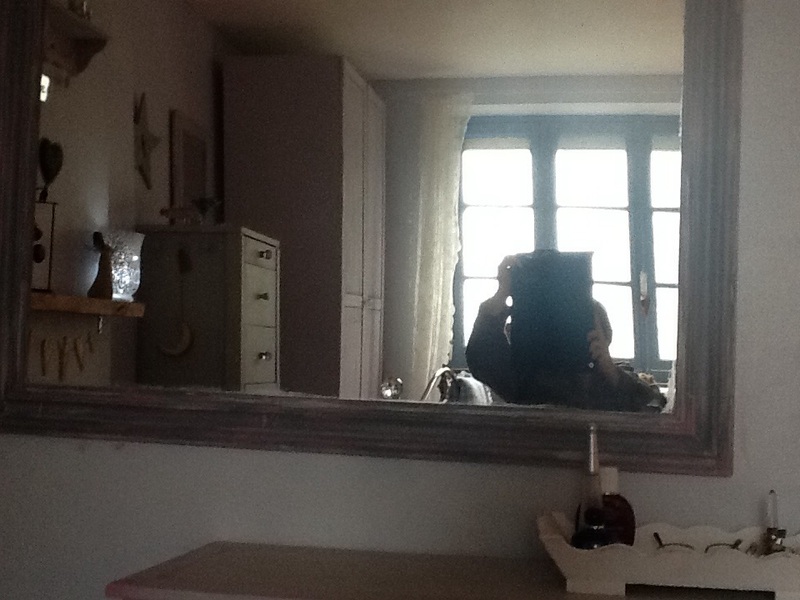 I wonder if you might not start selling some shabby chic’ed furniture in the new year at vide-greniers? Thank you Ellen, you’re the second person to suggest that, and I am seriously thinking about it. There is some beautiful old furniture out here so I will be looking into it in the new year. Merry Christmas and happy New year to you both.